Aloe vera, perhaps the most ubiquitous succulent in the world, is the ultimate houseplant. It is small, easy to care for, and even useful! 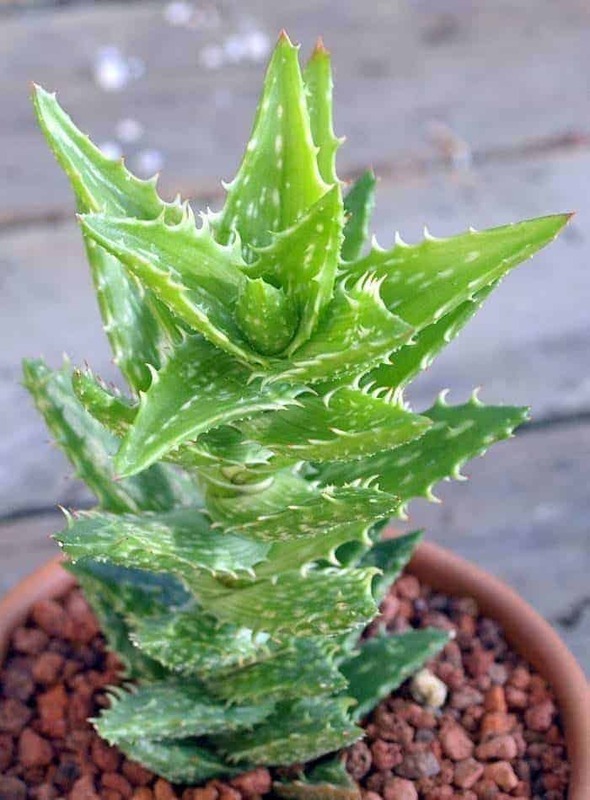 Aloe vera is an integral part of every plant-lover’s menagerie. 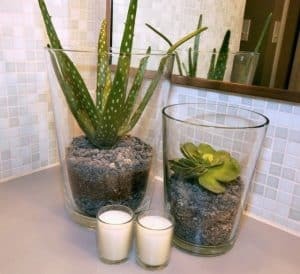 Let your eyes wander to that Aloe vera above your sink (yes, that’s where everyone keeps theirs). Admire the pleasantly plump leaves emanating from the center, the variegation in the form of light spots along the leaves, the lightly serrated edges. This is the quintessential succulent, but it’s more than that. It’s a staple of every household around the world. How did a simple succulent from Northern Africa make it into homes across the globe? The answer lies in its ease of care and myriad of uses. Aloe vera has a few other names. It is commonly just called Aloe. 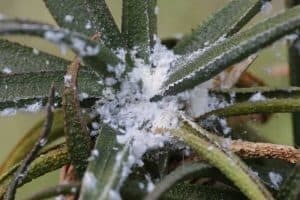 It has a couple of scientific names that all refer to the same plant: Aloe vera, Aloe barbadensis, Aloe vulgaris, and more. In addition, there are innumerable hybrids (so naming gets pretty wonky). There are many, many subspecies of Aloe vera cultivated in every corner of the planet. These days it is grown commercially not just for use as house plants, but also for cosmetics, food, and medicine. 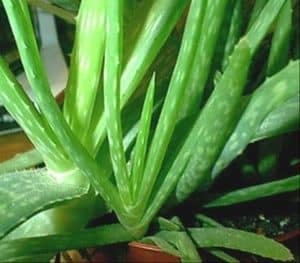 Aloe vera is among the easiest of plants to care for. Being a succulent, it can survive abuse and negligence like few other plants can. This is one of those succulents that thrives in a window. Direct light for about 8 hours a day is optimal, but Aloe is forgiving. It often grows in indirect light too – on a desk or in the shade under another plant. Aloes that get a lot of direct sun usually begin to turn reddish-brown. Don’t fret! This is not harmful to your plant! It’s indicative of a healthy plant with lots of sun. They change color to help prevent damage from so much sunlight. You can modulate the color of your Aloe by exposing it to more or less light. Be careful to make lighting changes gradually so you avoid giving your plants a sunburn. If you find your Aloe vera turning the wrong kind of brown – a yellowish kind that implies not enough sun, you’ll need to change the lighting. Try another window with more sun, moving the pot outside, or a grow lamp. Grow lamps are inexpensive lighting solutions that can allow you to expand your collection beyond the window sill. Like all succulents, Aloes prefer infrequent drenchings. Depending on the time of year, the humidity, the temperature, etc. the time between waterings can differ. A good rule of thumb is to water succulents about once a week. During a hot summer you might water a little more. Likewise, in the winter you won’t need to water as often. If you’re not sure, stick your finger a couple inches down into the soil. If it’s dry all the way down, you’re good to go! When watering, pour water at the base of the plant until all the soil is entirely drenched and water begins to run out of the bottom of the pot. It’s not the amount of water you give them that kills succulents, it’s giving it to them too frequently. Try to avoid watering the leaves of succulents as well – they only take in water from their roots. In fact, water sitting on the leaves can act as a magnifying glass for the sun and burn your plants! Fast-draining soils are a must for Aloe vera. They rely on their soil to remove excess moisture from their roots, otherwise the plant will drown. These soils typically have very little organic matter (stuff like peat or humus) and are mostly comprised of inorganic substrates (pebbles, sand, perlite, etc.) Unfortunately, most plants you buy from large retailers are not potted in the correct soil. When you bring your plant home, you’ll want to repot it immediately into a new pot with new soil. If you want to save money in the long run, you are best off making your own succulent soil. Buying some perlite or builder’s sand to add to a ready made cactus soil will stretch your dollar while giving you quality soil. If you only have a few succulents or don’t want to get your hands too messy, we have compiled a list of the best commercially-available succulent soils. This succulent is one of those no-fuss propagators. It occasionally produce pups, little clones of the parents, that grow in the soil alongside their mother. On one hand it’s great because the plant will propagate without any help from you. On the other hand, it does it at its own pace. Rarely, however, do you hear people complaining about the rate at which Aloe vera propagates. In fact, it’s usually the opposite. After they reach maturity, the should propagate very frequently. If you’re having trouble gettings pups, vary watering. Some people report that allowing the plant to go thirsty for a while increases the chance of pupping. Also note that many Aloes prefer to be slightly root-bound, so make sure they’re not in a pot that’s too large! to snip off the pup. Use either a very sharp, clean knife or some garden scissors. Snip the root in such a way that it favors the baby – mom has plenty more roots. 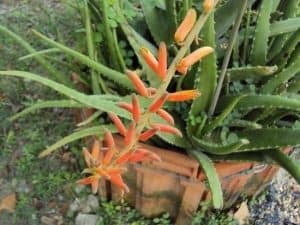 Like most plants, Aloe vera can and do bloom. They have very pretty red, orange, or yellow flowers that last a couple weeks. You could pollinate them and gather seeds, of course, but it takes a long time to grow succulents from seeds. This succulent is an incredibly versatile plant. It can be, and has been, used for almost everything. Here are some of our favorites (and the science to support them)! Perhaps the most common use for this succulent is for relieving sunburn. My own mother certainly prescribed it when I was younger! Science has examined how effective it is, and the result is probably-maybe. 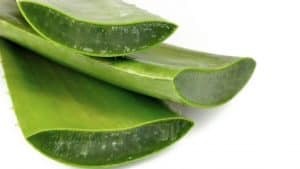 To treat burns with aloe, simply pluck a fat leaf. Slice off the thick skin, like you’re peeling a carrot. That gel inside will provide cool relief (although you’ll be sticky afterwards!). Rub it directly on burn. For the Type II diabetics among us, aloe might be your new friend! Including 2 tablespoons of aloe juice in your diet each day was shown to be effective at reducing blood sugar levels! You can make smoothies with aloe gel if you want, or you can buy yummy drinks like this one at most grocery stores. A 2013 study listed aloe as a plant capable of reducing the pain from heartburn! They said drinking a few ounces when you eat can not only suppress the pain, but also help to heal the damaged tissue! Talk about superfood! 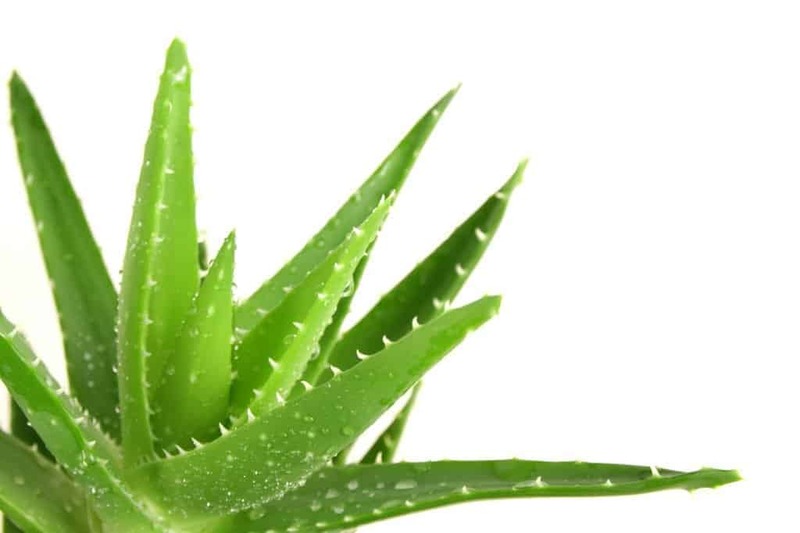 The Indian Journal of Dermatology published a brief that includes aloe as a treatment for acne. Rubbing the gel on affected skin daily for a few days should show improvement. You can squeeze the gel into a jar rather than plucking a new leaf every day! Refrigerate it so it doesn’t spoil quickly. Latex, which occurs naturally in the “peel” of the aloe, is a powerful laxative. Eating a very small amount can help those with bowel problems. Be aware if you have a latex allergy or not before trying this!! Come on, I don’t have to tell you this, do I?? Everyone has an aloe! If you don’t, surely you know someone who is trying to give one away! We already discussed how prolific they are. If you still can’t find one for free, you can purchase them just about anywhere. Every store that sells plants will sell Aloe vera. That includes grocery stores and home improvement stores! If you want to buy some online, Mountain Crest Gardens has an excellent selection of succulents – including aloe. They always ship very healthy plants, very quickly. Of course, you can purchase aloe on Amazon as well if you think that’s easier. That’s all-oe for now, folks! What do you think? Is there anything we missed?? Being in Canada it is difficult to find succulents in the winter time. May of the large cities may have specialty shops but not out in the rural areas. I’m trying to grow some from seed but without much success. Sometimes I try soaking the seed with a paper towel and baggie and sometimes into the soil. Seeds are from China so that may be the problem. Suggestions? Yeah, seeds from China are always pretty sketchy. A lot of seeds labeled as succulents end up being wildflowers (if they even germinate at all). Usually succulent seeds need a degree of warmth. Try putting them on moist soil, in indirect light, and provide a source of warmth if necessary.